What if your classic vehicle could start and run like a modern one? No sputtering, no timing variations, no worn out mechanical parts. Just rock solid efficiency that only RPM based timing can provide. Mechanical points and magnetic (Hall Effect) ignitions allow timing to bounce back and forth causing erratic idle, loss of power, and damaging detonation. Optical devices are used in the medical, military, and manufacturing world because of their superior accuracy. We use the same technology. Did you know magnetic sensors change timing as they warm up? The use of a magnetic type sensor can cause timing to be off ±7° or more. Low quality magnets can be even worse. Is the system known for reliability? Can timing be adjusted at multiple points in the RPM range to specific settings? Does it have variable coil dwell to prevent coil overheating and battery drain? Does it have automatic coil shut off even with the key left on? Does it have low voltage protection which can over heat electronics? Does is Multiple Spark at ALL engine speeds to maximize combustion? ​Does it come with everything you need (ignition, trigger, coil, wires) or do you have to order parts from various suppliers to make it work? Below is a picture of the encoder wheel. As the wheel rotates, twin optical light beams track coil on and off times, rev limits, and precisely track engine rotation over 180 times per rotation using high quality optical technology. When your piston is at Top Dead Center (TDC) our ignition is set by rotating the encoder until the small LED light glows red. Tighten the bolt or screw and your timing is now set. How easy is that? Below is one example of our timing map. The red line indicates COIL SATURATE (when the coil turns on). Most ignitions do not adjust coil saturation (dwell) which causes coil over heating and failure when using modern coil designs. The yellow/blue/green lines indicate each of the three (3) sparks. All lines can be adjusted using the black dots. Custom timing maps are now easy to design or change. Each ignition has 4 timing maps loaded into it. We can design custom settings for NOS or forced induction engines or you can purchase a programmer kit to do it yourself. Our ignition requires modern coils that are designed to perform at a level much higher than a normal coil. Our coils are manufactured to our specifications and final assembly is performed at our USA facility. Our coils will not operate correctly with other ignitions. We provide new spark plug wires for the same reason. Our C5 ignition must always be used with the parts provided in the kit. Why do ignition coils fail so often? The longer a coil is "turned on" the hotter it gets. Modern coils produce amazing spark but are more sensitive to over heating. If you cannot control saturation times you are not able to use the best coils available. We control coil heat better than any other ignition. I was told all coils are the same. Is that true? Great question! All coils are definitely not made the same. I core (straight core) paper wrapped coils are the most common because they are inexpensive to manufacture and function reliably with low rpm, low power engines such as a lawn mower or garden tractors. Most replacement motorcycle coils are "I" core even though it is the least efficient design you could use. C or E core coils produce a much stronger voltage and have increased efficiency. Most of these are Epoxy filled coils and cost more but perform at a higher level. Many of the premium replacement coils use this design for high compression or high rpm engines. Section Bobbin coils are designed for maximum resistance to vibration and they perform at the highest level of efficiency. They are the best commercially available engine coil that exists. They saturate quickly which causes over heating if used with low grade triggers that do not have variable rpm based saturation control. For this reason many ignition companies avoid using this amazing technology. Power Arc electronics have the ability to vary saturation times and can safely control a section bobbin coil to gain huge advantages they provide. This is why all C5 Performance ignitions use section bobbin coils. Below is a generic picture of a section bobbin coil without the cover on it. The coil and optic reader work together to multi-spark 3 times per revolution well beyond 10,000 rpm. Our ignition module comes with multiple timing maps loaded inside. You can change maps even while running your vehicle. To better understand why you might want to change maps, first you must understand the relationship between timing advance, fuel burn rate, and engine load as you cruise down the road. As your engine spins faster, the fuel must be ignited sooner. Perfect "timing" increases efficiency. You want to squeeze all the power you can from every gallon (liter) of fuel your engine uses. 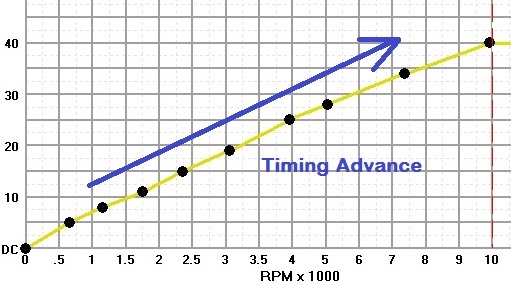 The first chart shows a timing map or "curve" that increases timing advance as rpm increases. A timing curve determines when the spark plug ignites the fuel. Although we do not use this curve, it does help you understand the relationship between engine speed and the timing of the spark event. Now lets talk about where in this timing curve our motorcycle, car, or tractor might operate. 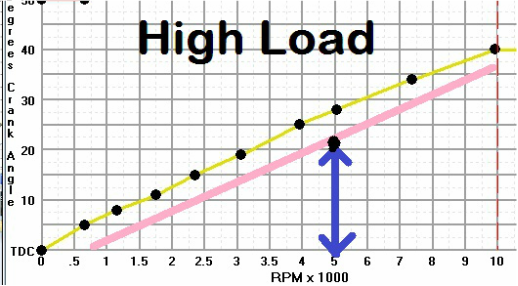 For this discussion we'll choose 5,000 rpm and assume this timing is correct for flat ground with an average load (no heavy cargo or extreme speeds). This chart shows that at 5,000 rpm your sparkplug ignites the fuel at 28 degrees of crankshaft rotation before the piston reaches TDC (Top Dead Center). The lead time of the spark event before TDC is simply called "TIMING". The higher the engine load, the faster fuel burns regardless of engine speed. The speed that combustion takes place is called the "BURN RATE". 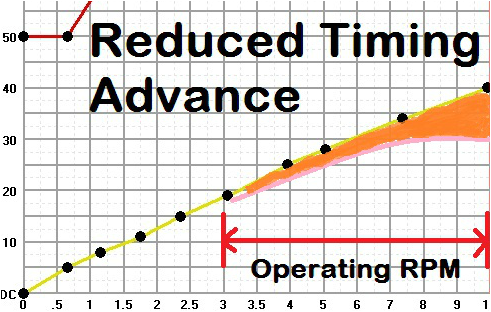 The pink line shown above is an example of how the timing requirements change for an increased engine load. 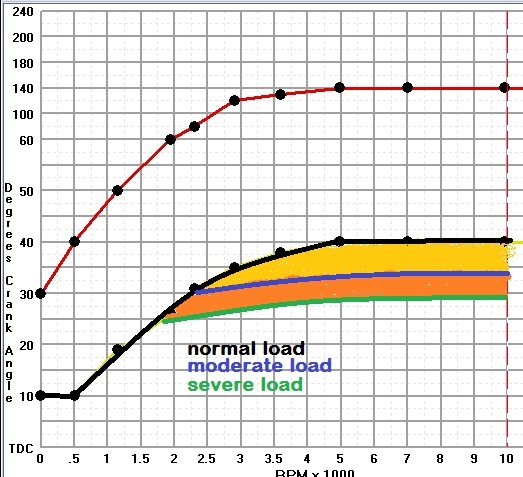 A timing curve that works on flat ground with a normal load is not ideal when climbing a hill or pulling more weight. You must either change fuel, down shift to a lower gear, or reduce the timing advance to match the load. 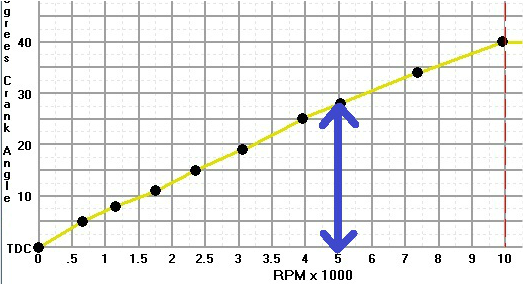 If your engine operates in the upper rpm range at normal road speeds there is no need to reduce timing at idle rpm, correct? Take a look at the chart below. 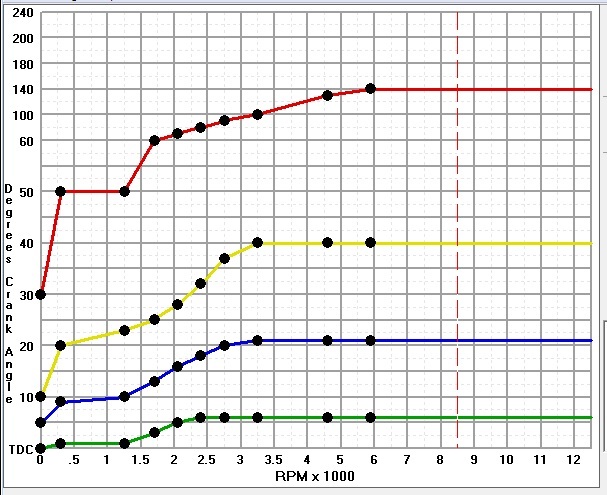 This is how our ignition would retard timing if you changed from the normal curve to one designed for higher loads. While operating on the road, you only need to reduce timing in the RPM range you will be using. Remember, this is not a curve we actually use. These charts are purely for teaching purposes. Now take a look at how timing might be reduced if you could change it multiple times depending on the vehicle load. We hope this helps you understand timing, and the effects of LOAD on the timing requirements of your vehicle. The terms "timing" and "timing curve" are used to indicate the crank/piston location when the spark plug ignites the fuel. Timing is determined by the burn rate of the fuel you use, and by the load of the engine. As load increases, the fuel burns faster. The means the timing advance must be reduced. You can do several things when your vehicle has an increase in load: Increase octane (slow the burn), downshift to reduce load via gearing, or reduce timing advance to match the new burn rate. Now lets talk about our own software a bit more! The RED line indicates when our ignition turns the coil ON (called saturation). The amount of crankshaft rotation that the coil is ON is typically called DWELL. We are one of only a handful of ignitions that reduce saturation time at lower rpm to reduce stress on the battery and to reduce coil temperature for increased reliability. The Yellow line is the timing map of the first spark. The Blue and Green lines indicate the second and third sparks. Unlike other ignitions, the C5 has three (3) sparks which can all be adjusted. This allows racers, tractor pullers, and high performance tuners to build a reliable performance curve and eliminate harmful detonation. This curve (shown above) is for a higher load than the previous picture. 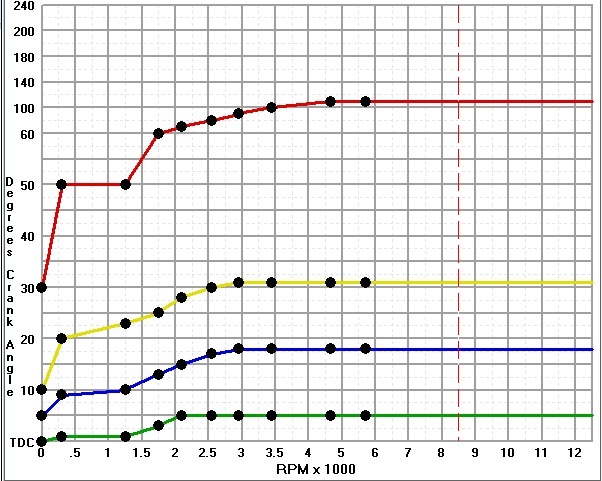 Notice the timing curves (yellow, blue, and green) do not advance as much. This is because under a high load the fuel burns faster. We do not have to ignite the fuel as far in advance due to the increase in burn rate. In this example maximum timing has been reduced by almost 10 degrees! There are books written about this subject. We hope this explanation helped you begin to understand why even on a low rpm engine, it is critical to have precise timing. Our goal is to increase performance and reliability for our customers.